Ready for a summer blast? Eager to make a big splash for the summer? Well, Nashville Shores can get you all wet in more ways than you can imagine. Their recipe is pretty simple: Just add water. To get things started, you might test the swirling liquid in the Breaker Bay Wave Pool or the Castaway Creek Lazy River Raft Ride. These two H2O attractions boast a combined one million gallons of cool, clear water. If that's not enough to cool your jets, the new, $2-million-plus, 57-foot-tall, 530-foot-long raft water slide named the Big Kahuna should do the trick. "This has been our most requested ride through our season pass holders. People enjoy experiencing fun, laughs and thrills with friends and family. Four people [riders must be 42-inches tall] can ride this together. It's six stories high, has five major curves and an average speed of 13 miles per hours," said Daniel Strobel, the water park's director of marketing, about the 30-second thrill trip and the first family raft water slide in Middle Tennessee. "Guests who have not visited in several years will be amazed by all of the changes. When they walk through the gates, it's a new Nashville Shores," he says. Since 2009, when the 385-acre park was bought by a group headed by Kieran Burke, formerly CEO of Six Flags, Nashville Shores has been going through intentional growing pains. The wave pool and lazy river raft ride were added in 2010, and Kowabunga Beach, with its four-story water tree house and sprayground, sprouted in 2011. The family fun park has pretty much doubled its size, plus it also features 84 RV sites, 20 lakeside cabins and a 310-foot marina, thus its formal name of Nashville Shores Lakeside Resort. "We're looking for the best way to utilize all this great lakeside property. We've been changing primarily from a summer attraction to more of a year-round destination," Strobel said of the park, which uses 500 seasonal employees to serve its approximate 280,000 to 300,000 annual guests. "There have been other improvements since last year: new concourse areas, more retail and concession outlets and more seating areas," said Strobel. "We're also planted thousands of new flowers, trees and shrubs." But it's the water that really brings in the kids as temperatures rise. On opening day Bellevue's Cynthia Dunomes and her husband watched their sons, Branson, 8, and Zander, 6, have a ball soaking themselves at Kowabunga Beach with its four-story water tree house, giant bucket of fun, sprayground, four slides and more than 70 interactive water features. "We were season pass holders last year and came back this year," said the youngsters' mother. "The kids love it. Today being opening day, everybody was anxious to get in the water." Zander enjoys the water slides and water guns that shoot out a spray of the cool liquid, but his favorite place here is Lazy River. "It's fun because you can fall in," he says. Also soaking up the rays and the water droplets this Saturday was Allie Ruhlander, 16, of Fayetteville, who brought along two foreign exchange student-friends, Marta Ysbert of Spain and Bukyung Kang of South Korea. "We came here for a day of fun," said Ruhlander standing next to the wave pool. "The water slides are the most fun. You get a real rush." The water options here includes nine slides with such names as Music City Racer, Big Scream, Tennessee Twisters, Thunder & Lightning and Twin Cyclones. There are a variety of pools like Suntan Lagoon, Wacky Pond and Lily Pad Pool. On or near the waters of Percy Priest Lake, guests can enjoy a sandy beach for tanning and playing volleyball or paddle kayaks or ride a banana boat or cruise the lake for 20 minutes or so in the Nashville Shoreliner. As for more details on the Big Kahuna, this mega-tube serpentine raft ride blasts visitors into a dark, enclosed tunnel with a series of unpredictable twists and turns, breathtaking drops and back-to-back curves. The raft will then shoot through the tunnel opening, splash through the wildly fun S-shaped waterway while catching some major hang time along high bank walls before hitting splashdown in the catch pool. The Nashville Shores Wave Pool is 208 feet long and 200 feet wide at the "beach." It has a maximum depth of six feet and is designed for up to 630 swimmers at a time. The Lazy River Raft Ride flows in a circuit of about 1,000 feet and reaches a maximum depth of 32 inches and can handle 470 folks floating on tubes. The water park offers guests free tubes and sunscreen and will hold fireworks shows on May 24, July 3 and Sept. 6. At the wave pool on five Friday nights (July 10, 17, 24, 31 and Aug. 7), dive-in movies will be show, including "Up," "Frozen Sing Along," "Elf," "Finding Nemo," and "Big Heroes 6." Three years ago, Nashville Shores added Treetop Adventure Park, which they bill as the No. 1 ropes course and zip line attraction in Middle Tennessee. 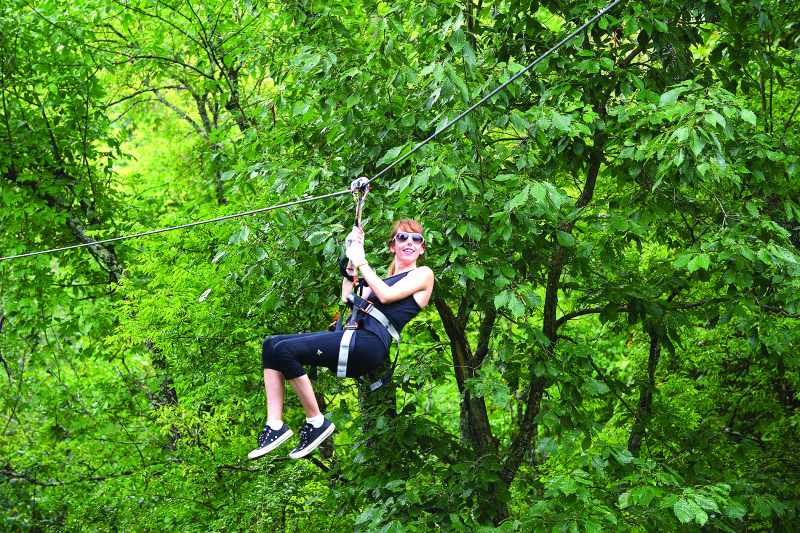 A separate attraction from the water park, the tree adventure park features a series of aerial adventure courses where individuals navigate close to 100 different obstacles. It has suspended bridges, 10 zip lines (two more than 600 feet long), cargo nets, scrambling walls, ladders and Tarzan jumps. In the fall the park will introduce HallowScream, a Halloween event for "family by day, fright by night" with haunted woods, trails and hayrides. That means three options await guests across the seasons: you can get wet, get high and get scared.